During the week of November 12th, EMSI participated in the Clean Gulf Conference held in New Orleans, Louisiana. This annual conference covered spill preparedness and response topics, providing a forum for responders, operators, regulators, equipment providers, and environmental groups to share best practices and lessons-learned for spill response improvement. EMSI is proud to continue participation every year in this critical conference. A member of the Clean Gulf Conference Planning Committee, EMSI President Ron Cantin spoke about enhancing the realism and value of exercises as a member of the panel Exercise Success! Train Like You Fight and Fight Like You Train. In speaking on this topic, Ron specifically focused on improving response capabilities through exercises. While preparedness and prevention efforts have been successful in decreasing the frequency of spills, which is good news overall, it has placed greater importance on creating challenging and realistic exercise environments, as that is now where responders gain much of their experience. Yet exercises are repeatedly reinforcing bad habits and leaving our response and Incident Management Teams (IMTs) underprepared. By skipping the initial response phase, exercise planners and responders are missing an important and formative time in the management of the incident, where resource status and situational awareness are built and the Incident Management Team (IMT) forms. As EMSI founder Chuck Mills says, “What starts right, stays right.” By skipping the initial response, responders never get to practice how to start the incident response during that turbulent period immediately following the incident. Typically following the ICS-201 briefing and StartEx, exercises are designed to push responders into the IAP Planning Process instead of building through the initial response phases. This is usually driven by exercise evaluation criteria skewed towards IAP development, with a decreased emphasis placed on managing current operations. Furthermore, shortcomings in scenario context and exercise injects to highlight the importance of current operations allow players to largely ignore the current operations, something that would never occur on a real response. Then, due to exercise time allotment limitations, the exercise timeline is compressed causing the IMT to rush through the planning process, with many exercises declaring EndEx and success, following the Planning Meeting. 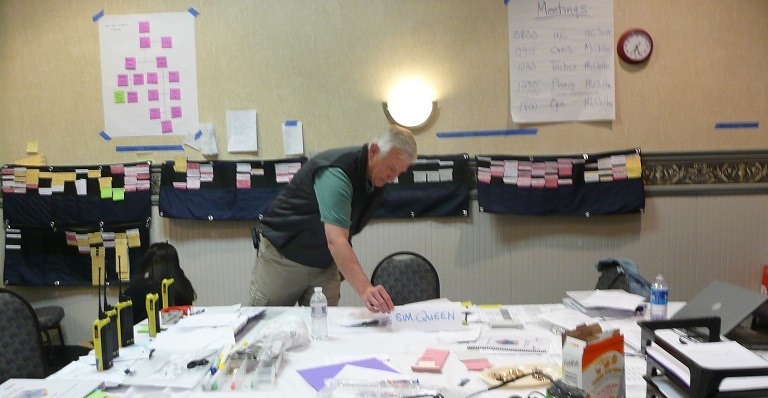 Exercises need to emphasize building a lean and efficient organization that is shaped by the needs of the incident. They need to focus on establishing the rest of the IMT and support structure and processes, including incident facilities, commensurate with the size, scope, and requirements of the operations. Exercise evaluators need to ensure accurate and comprehensive resource management is established and maintained for every resource assigned to the incident. Finally, they need to practice the difficult transition from initial response to IAP development, including the requirement to simultaneously manage current operations while planning for future operations. Supporting Operations is the primary responsibility of an IMT. The relationship between the IMT and the field is a key indicator of IMT success. Exercises need to place an increased focus on the communications/information linkage between the field and the ICP. Additionally, an emphasis on the relationship and connectivity between Operations and Logistics is necessary. Finally, exercises need to improve the Planning Section support to Operations, specifically from Resources, Situation, and Environmental Units. To facilitate this and increase emphasis on current operations and field activities, EMSI recommends establishing a “Truth Cell”, where field supervisors (e.g., Division and Group Supervisors, Strike Team and Task Force Leaders) are located. Field supervisors in the Truth Cell will execute direction from the Operations Section, essentially creating a “field” environment. Operating from the Truth Cell, field personnel can interact with the IMT like they would on an actual incident. Field and operations related injects should be delivered through the Truth Cell and filter up to the IMT, as required, to replicate the transmission of information up and down the chain of command. All of this will force the IMT to focus on and support operations like they would need to in a real incident. In addition to Operations Section field supervisors, Assistant Safety Officers and Field Observers can be located in the Truth Cell to add another layer of realism to the exercise. In recent years, exercises have devolved into running through the Operational Planning Process instead of developing quality products. The quality of the IAP should be measured by what is written on the paper, not the ability to produce paper. Exercises need to assess the quality of the IAP, not simply the ability to crank through the process. They need to evaluate the inputs to the IAP process and how that translates into meaningful and useful information that makes it into the IAP. This process cannot be rushed due to exercise time constraints; it must include accurate and complete resource status and situational awareness. 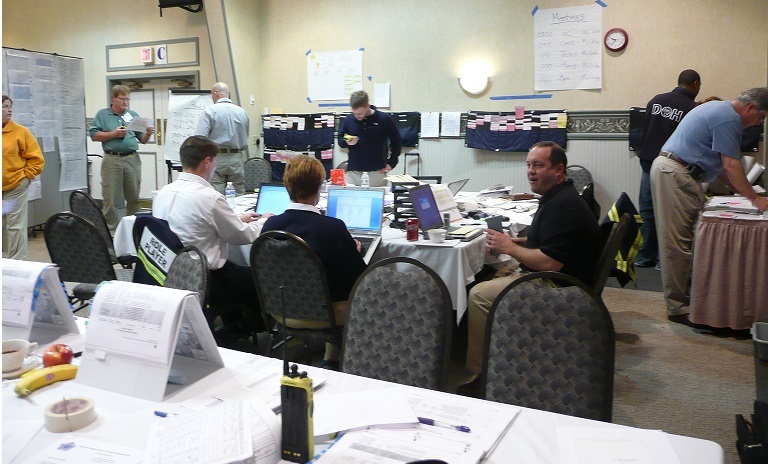 Exercises should also emphasize all of the other incident management activities occurring outside of the Operational Planning Process (stakeholder engagement, public information, logistics, and finance, etc. ), as well as integration and usefulness of support plans. Finally, the IMT needs to grasp and understand the realistic incident potential, and this needs to be reflected in the planning process and the IAP. The Exercise Success! Train Like You Fight and Fight Like You Train panel was chaired by Ms. Barbara Parker from Shell and moderated by Mr. Michael Sams from the U.S. Coast Guard. In addition to Ron, panel members included Mr. Sam Sacco from Strategy & Communications and Mr. Jim Elliott from the Teichman Group. Mr. Sacco discussed improving Public Information / Joint Information Center exercise participation, while Mr. Elliott discussed the value of practicing remote participation in exercises. Overall, this year’s Clean Gulf Conference was another hit. EMSI looks forward to continuing to support this conference in the years to come, assisting industry partners in being prepared for all-hazards. EMSI response and incident management support services are available to members of Clean Gulf Associates Services through the Preferred Response Organization (PROs) program. Clean Gulf Associates created PROs as a network of highly professional oil spill response service providers to work hand-in-hand with Clean Gulf Associates employees during a response. Under this program, EMSI provides Response Management Services. Specific services we will offer include Incident Management Team (IMT) support, such as filling actual positions, to coaching/advising IMT personnel, evaluating the performance of an IMT, and preparing comprehensive after-action documents. Wonder What’s in Santa’s Go Kit?